I work in a home studio where I design and form each piece on a potters wheel. I produce both functional and decorative pieces made with porcelain and stoneware clays. I use a part time assistant to help with the firing and other tasks after Ive thrown the pieces. The porcelain is reduction fired to cone 11-12 in a gas kiln. Clay fired to these temperatures is so hard that it is impermeable to liquids and can be used to hold water and oil if so desired. My functional work includes ikebana vases, porcelain miniatures, oil candles, aroma diffusers, and a changing variety of bowls and platters. 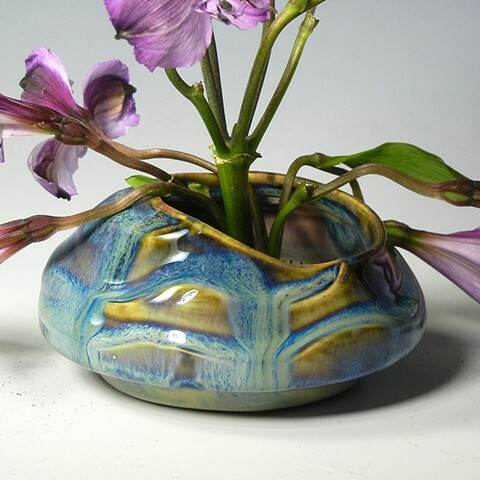 I also use raku techniques to make art pieces where the exciting vagaries of fire and smoke combined with my glazing achieve a dynamic tension of both controlled and random effects on the elegant, simple forms I create. Although always involved in art (jewelry, photography and sculpture) it wasnt until 1989 at the age of 42 that I began to study pottery. Six years later I resigned my job as a middle school science teacher and began life as a full time potter making a living at art fairs in the Midwest. I currently serve as ceramics department head of the Indianapolis Art Center.The hours needed to make all the work and still run the small business of an artist craftsman are incredible, but I havent regretted the decision for a moment.